Forget Runaway Bride - this runaway flower girl takes the cuteness cake! Forget Runaway Bride – this runaway flower girl takes the cuteness cake! Move over Julia Roberts. There’s a new little lady running her way down the aisle and into the hearts of people everywhere. Come and watch how three-year-old Chloe steals the spotlight in a mad dash all mums of threeangers will know too well. Kids, if you’re going to attend a fancy wedding, please be sure to follow this little girl’s lead and run away. 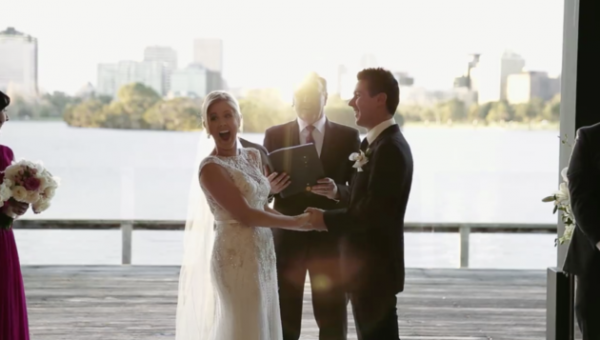 It makes for a great story… and an even better video for the entire wedding party to remember. Katie Quirk is the epitome of beauty on her wedding day. Dressed in a gorgeous white dress with the stunning Albert Park Lake in Melbourne in the background, all eyes should be on her as she recites her vows to her future husband, Tom. But Katie’s niece, Chloe, had other plans. And Burgess Video captured the entire thing. As you watch the couple’s lovely wedding video, you can’t help but notice the absolute hilarity happening in the background as the couple’s flower girl runs away with her formal-attire-clad mother chasing after her. At first Katie didn’t notice her cheeky niece running away and her sister-in-law doing the high-heel shuffle, desperately trying to catch Chloe without falling on the board walk. But it doesn’t take long for Katie, Tom and all the guests to turn around and watch the whole thing unfold. Kids – you gotta love them, even when you’re chasing them down a boardwalk. So, newly engaged couples out there – will you allow children at your wedding? Or has this video deterred you from having a child-friendly ceremony?